Economist Hyman Minsky is often cited as the forerunner of the job guarantee movement. In order to get a better understanding of its origins, I decided to read a collection of his writings on the subject that was published by the Levy Institute in 2013. The title of the collection is “Ending Poverty: Jobs, Not Welfare” and unfortunately kind of tells you where Minsky is coming from on this stuff. 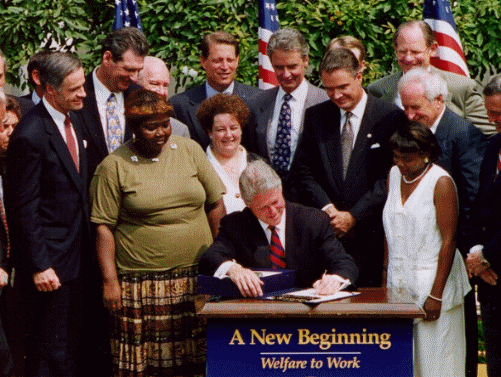 Minsky goes on to describe welfare state measures as “the anti-employment thrust to policy,” a phrase that he uses to describe both benefit programs for able-bodied adults like AFDC, unemployment insurance, and food stamps and shifts to keep kids in school longer and lower the retirement age. One striking characteristic of policy over the past 40 years has been a consistent thrust toward the generation of income independent of current labor market participation. If an economy is felt to be unable to generate a sufficient number of jobs to employ all who are willing and able to work under one set of social rules, then one way to eliminate unemployment is to change the social rules so that labor market participation is decreased. Raising the school-leaving age and improving retirement benefits [while lowering the eligibility age] is one tack; another is to improve the money income that is available independent of labor market participation. Welfare, unemployment insurance, and food stamps are additional elements in the anti-employment thrust to policy. His arguments against welfare payments did not only focus on how they discourage employment. For instance, he writes that “[the food stamp program] is an example of how excessive sentimentality affects policy, and in addition of how a poorly thought-out policy effort that reflects good intentions has undesirable side effects. The food stamp program is a significant factor generating the inflation that has so troubled us in the past several years.” He is referring here to the global stagflation of the 1970s, which mainstream economists tend to attribute to the oil crisis of the period. When he goes on to discuss his proposal, he does so under the heading “Reform of Transfer Payments” and specifically positions his proposal as being counter to the “transfer payment mess,” by which he means the welfare state. The idea that dignity and social value only comes from “earned success,” by which it is meant labor income, is of course the signature view of AEI president Arthur Brooks who, like Minsky, frowns upon welfare payments because they supposedly do not deliver earned success. How capitalists manage to live with themselves despite receiving huge quantities of non-labor income remains mysterious. It’s clear that Minsky viewed the job guarantee as a welfare state replacement program, at least in significant part. His views on welfare would today be classified as quite right-wing and are also just empirically wrong. The Columbia measure — a poverty metric based on the Supplemental Poverty Measure that includes transfer payments in its income definition — shows that poverty declined from 26 percent in 1967 to 16 percent in 2012, a fall of nearly 40 percent. Over the same period, poverty measured by market income did not fall at all and indeed ticked up slightly, meaning that the welfare state is solely responsible for the significant decline in poverty over the period.